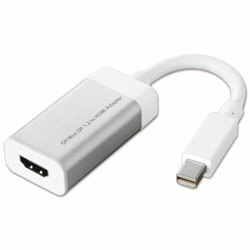 The Mini DisplayPort to HDMI Adapter is designed for connecting a DisplayPort embedded device (laptop, desktop and etc.) to a HDMI embedded device (television, monitor and etc.). With the HDMI and DisplayPort 1.2a specifications, this adapter's bandwidth of video can be reached to 3.0 Gbps and the resolution is up to 2160p. Besides, plug and play design makes it easy to use; no need to install extra drivers when plugging the adapter into the device. Simply attach the adapter to the device and begin using right away. *Specification is subject to change without further notice.